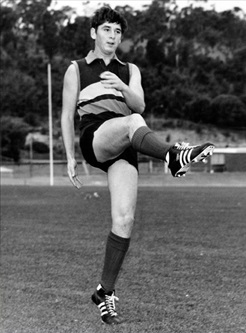 After commencing at North Hobart, dynamic wingman Tony Pickett burst onto the Tasmanian scene in 1974 and 1975, winning consecutive best and fairest awards in strong North Launceston combinations under Tony Haenen and Peter Daniel. Recruited by Carlton, Pickett made an immediate impression, kicking four goals in his debut game against Collingwood and playing 24 senior games in his first year. Pickett finished his playing career with City South and captain coached them to the NTFA grand final in 1980. He served Tasmanian football in the high schools of north east Tasmania for many decades following his retirement from senior football.